I promised I wouldn’t but I just gave it a name. :) Actually, it’s based on a tweet from Marie Haynes saying, “It’s March Madness!” after I posted screenshots of the wild tremor starting on 3/14/18. More about that tremor soon. 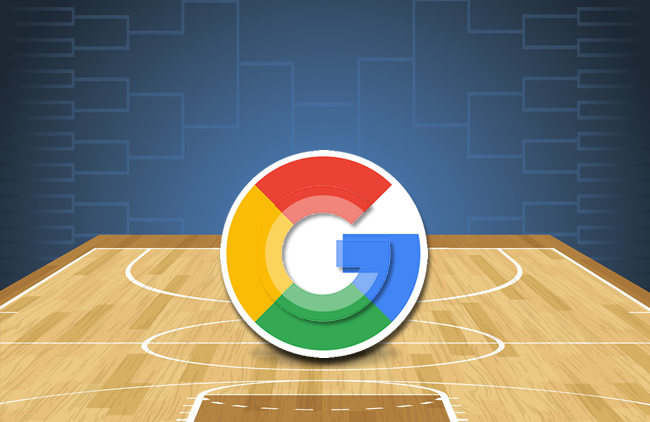 As many of you know, Google pushed a really big update starting the week of March 5, 2018 (with Google now confirming it started rolling out on March 7, 2018). Many sites saw impact on 3/9, but I started seeing impact before that date (internationally). I received the first calls and messages about major volatility on 3/8, and when digging into those sites, you could clearly see the jumps or drops starting on 3/8 and 3/9. I started sharing screenshots of what I was seeing that weekend and then we received confirmation from Google’s Danny Sullivan that there was a big update. 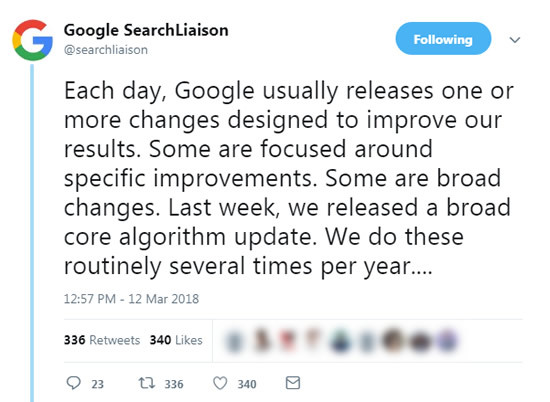 By the way, I love the transparency that Danny is bringing to site owners via the @searchliaison Twitter account. If you aren’t following that account yet, you should. We typically don’t receive confirmation from Google about major updates, so it was great to hear that from Danny. Also, he explained more about what he called “broad updates” that focus on quality versus “focused updates” that occur all the time. Anyone focusing on algorithm updates knows that there are several per year that are huge (and make the earth shake). And then there are many small updates that most people don’t even notice. It was great to hear Danny clarify the difference between the two. Barry Schwartz covered that in a post soon after. As the update starting rolling out, I received the first messages and emails from companies that were impacted (and from clients seeing movement). Again, that was on 3/8. And just like with several other major quality updates, the canary in the coal mine was the gain or loss of rich snippets. Many aren’t aware of this, but there’s a quality threshold to rich snippets. Therefore, you can see sites gain or lose rich snippets when major quality updates roll out. Well, I saw that again with this update. And the first company to contact me was one working on improving quality after getting hit in December. They lost all of their star ratings when that update rolled out, but they gained all of them back with the March 7, 2018 update. Here’s a before and after shot of the percentage of queries yielding star ratings. So just be aware of this if you see rich snippets disappear, or if you suddenly gain them. There’s a chance that a broad quality update is rolling out. So we know a major update rolled out and we know that it was focused on quality. And all signs point to Google tinkering with its core algorithm with how it assesses quality. We can think of this update as a refinement of their previous quality updates. What exactly they refined is not known, but it does seem that Google is doing a better job at surfacing higher quality sites. In this post I’ll cover a number of different examples of impact (including both positive and negative movement). I’ll touch on what those sites were doing and how those things could be negatively or positively impacting the sites algorithmically. Then I’ll cover some important notes for sites moving forward, whether your site was negatively impacted or if recently surged. Let’s jump in. First a reminder: Significant improvement over the long-term. This means that if you’ve been negatively impacted, you probably won’t recover in a few weeks. Actually, you probably won’t recover in a month or two. From what John has said, and what I have seen in the field, it’s typically months of hard work before you can see recovery. So drive forward with big changes. That’s how you can surge back. The first surge I’m going to cover is an interesting one. It’s a site that contacted me a while ago for help and we have stayed in touch ever since. They were impacted negatively by several algorithm updates, including major quality updates. About eight months ago they began a serious remediation project. That included a number of important tasks. Remember, there’s never one smoking gun when it comes to quality. There’s usually a battery of smoking guns. This site decided to go all-in and tackle several important problems. First, they enhanced E-A-T by building more high-quality content by expert authors. And that new content helped attract links from well-known sites. That’s really important from an E-A-T perspective. 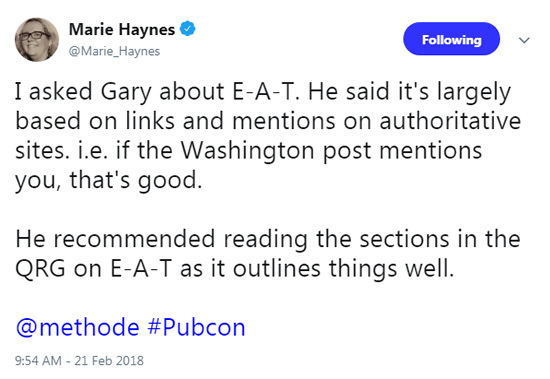 Side note: Marie Haynes asked Gary Illyes at Pubcon about how Google evaluates E-A-T and he said that Google largely looks at links from well-known sites. Therefore, building killer content that attracts links from well-known sites is a really smart thing to do (on several levels, including from an E-A-T perspective). Second, they highlighted the expertise of their authors. The site wasn’t doing that before and they wanted to make a point to emphasize this after seeing negative impact. Third, they drastically cut down on aggressive and deceptive advertising. I’ve written about this many times before when covering major quality updates. The Quality Rater Guidelines (QRG) mentions aggressive, disruptive, and deceptive advertising a number of times and I have seen aggressive, disruptive, or deceptive ads many, many times while analyzing sites negatively impacted during these broad quality updates. This company also labeled all ads clearly (to avoid deception), they cut down on aggressiveness, and more. Last, they improved usability overall. They restructured their site so it was better organized, it was easier for users to traverse, etc. And all of this paid off. They saw a nice increase during the March 7, 2018 update. Important point: It took them 8 months to see an increase like this. Remember when I mentioned that John Mueller said that Google wants to see significant improvement in quality over the long-term? He’s not kidding… and that’s exactly what happened here. Battle scars remain – A long road of mostly positive movement. The next increase I’ll cover is a long-term client of mine. I started helping the company back when medieval Panda and the original Penguin roamed the web. It’s an affiliate site and they have done very well over the years once they recovered from the algorithmic dynamic duo I just mentioned. But they recently started seeing a gradual decline in traffic. 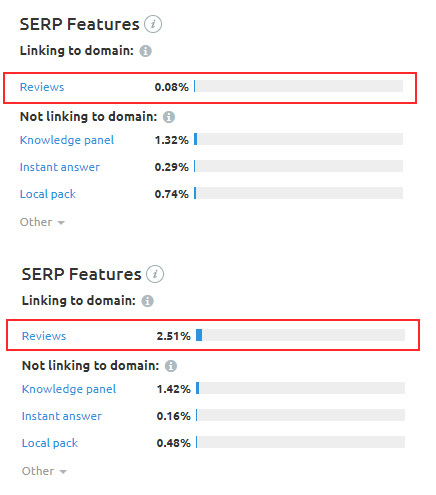 That decline looked very Panda-like to me based on the queries leading to the site that dropped. With the March 7, 2018 update, they saw a really nice increase. I’ve been helping them over the past several months audit the site from a quality perspective (which takes a number of factors into account). For example, content quality, user experience, affiliate setup, and from a technical SEO standpoint. I uncovered some important findings over the past several months and my client worked quickly to make those changes. They also made changes in how they produce content. So the combination of improving technical SEO, enhancing how they handle their affiliate setup, and enhancing content quality seemed to have paid off. The next example I’ll provide is a site that contacted me after reading my post about infinite spaces. In that post, I covered a case study of a site where I uncovered an infinite spaces problem impacting up to 10M urls. That’s bad, but a company reached out to me via my Facebook page after reading that post to let me know they are using the process I laid out to surface and address their own infinite spaces problem. And get this…. the problem was impacting up to 80M urls — yes, 80M. Wow. 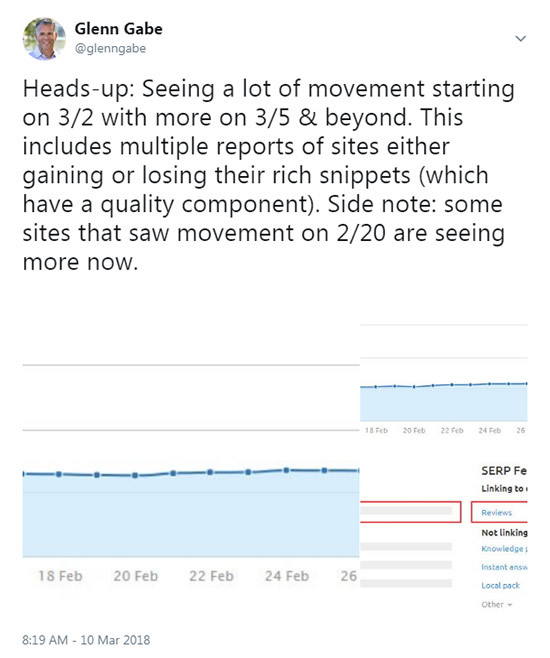 Their SEO team began handling that situation correctly starting in early February and they just messaged me after the March 7, 2018 update to explain that they saw a nice surge. It’s awesome to hear that, although I think everyone involved knows they have more work to do. But it’s great to see a boost during a quality update when they rid their site of 80M urls containing thin content. No way out… or is there? Another company I’m helping is in a competitive niche and has seen continuous downturns during quality updates. They also saw a nice increase during this update. They aren’t done yet, since we aren’t far into the engagement, but it was great to see the increase. They got hammered by the February 2017 update and saw more negative movement during subsequent updates. During my analysis (which I’m still neck deep in), I uncovered a number of quality problems ranging from thin content, low-quality content, technical problems causing quality problems, affiliate issues, and more. They are making changes quickly and moving down the right path, so it was awesome to see the increase. The first example of a drop I’m going to cover spans the gamut of low-quality user engagement. When digging into this site, I saw many examples of problems that I would surface during an audit. 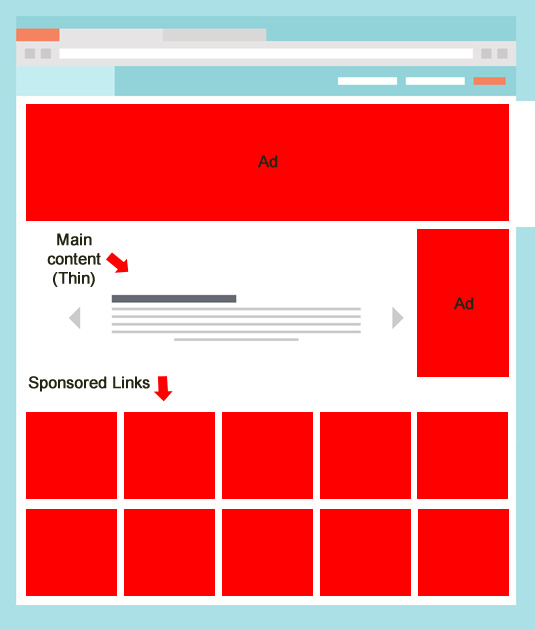 First, the site provides massive amounts of low-quality supplementary content and ads on each page. From a main content standpoint, the same content can often be found on other sites and the site does nothing to provide a value-add. The content was also split into tabs (which actually launched new urls), with no reason to do that other than to gain more ad impressions. There wasn’t much content, so splitting it across tabs made no sense at all. And to add insult to injury, the site bombards you with deceptive ads and low-quality supplementary content on each page (surrounding the mediocre main content). And not only are there low-quality ads, they are deceptive too. There’s often no ad label contained in the ad units, which makes it harder to identify what is related content from the site and which are ads that will whisk you off the site downstream. I’ve mentioned deceptive ads many times in my posts about major quality updates and this site had this problem all over the place. From an expertise, authoritativeness, and trust perspective, the site had NO E-A-T at all. I couldn’t even find solid contact information on the site. And the about section was literally the most general copy you could find. I didn’t see any solid author information either as I traversed the site. In addition to the ad situation, there were affiliate links prominently displayed on certain page types with no disclosure that they were affiliate links (very close to the main content). So again, there was a major deception component to the entire site. Like I said, this was the kitchen sink from a low-quality user engagement standpoint. I typically don’t name sites, but I’ve covered this one before (and I’m truly rooting for them). I’m a big fan of Giphy and hope they keep recovering after getting hammered on October 4, 2017 during the fall 2017 “hornets’ nest”. Here was the drop in October. 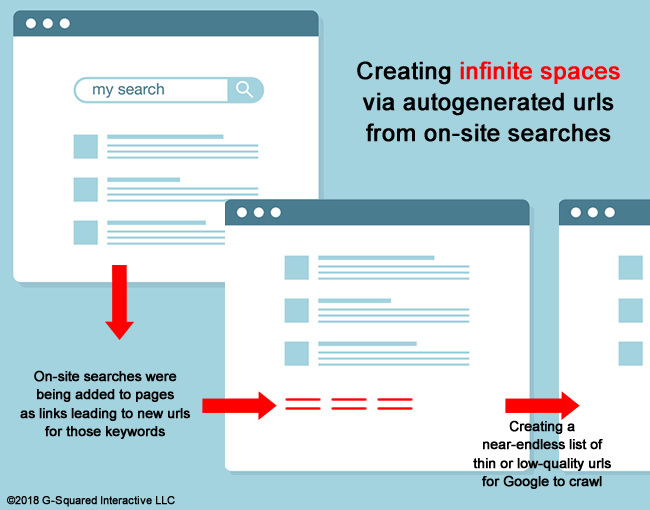 After getting destroyed as their search pages were deindexed by Google, they started creating new pages that weren’t simply internal search results pages. And that approach has been paying off. They have seen nice increases over the past two months as seen below. But… that just ended. They took a dip during the 3/7/18 update. So Google’s revamped quality algos are not digging giphy.com. Just an interesting side note. The next drop is from a site in a competitive niche I focus on heavily. It’s a big brand name in the niche and it just dropped heavily during the March 7 update. When checking out the drop, I noticed a sinister problem (that I’m assuming they know is going on). The site is essentially cloaking and showing users one thinner version of the content, but showing Google a much more robust version. There’s also an aggressive conversion tactic they are using, which destroys the user experience. Therefore, the site contains UX barriers, thin content, cloaking, and aggressive conversion tactics. And they got hit pretty hard. And there are many more examples of sites improving or dropping during this update (globally). It was a huge update and I can’t possibly cover everything here. I hope these examples were helpful, though. Google’s not done yet! The March 14, 2018 Tremor. And it was huge. Just when you thought the volatility was done, Google pushes more changes. I started receiving the first emails about the volatility on 3/14/18 and the swings were huge. I’m not sure if this is a tremor (where Google pushes a large update and then follows with tweaks to that update or if this is something else). Based on what I’m seeing, it very well could be connected to March 7. I’m seeing sites that were impacted by the 3/7/18 update with more movement starting on 3/14. I’m digging into those swings now to learn more about the tremor. Some sites are seeing massive gains or losses, so whatever Google pushed was a significant change. I’ll reach out to Google’s Danny Sullivan to see if he can shed some light on the situation. I’ll post an update here after I do. If you have seen negative impact during the March 7, 2018 update or the March 14 tremor, then I have some recommendations for you. Remember, the goal is to increase quality significantly over the long-term. There is typically not a quick fix. There’s no meta tag or minor change you will implement that will cause a surge during the next broad quality update. Instead, you need to hunt down all quality problems and fix them as quickly as you can. That might take months by the way so “quick” is relative. Below, I’ve included some bullets with my recommendations. And if you’ve read my previous posts about major quality updates, the bullets should be very familiar to you. Perform a Crawl Analysis and Audit Through The Lens of Quality: This means crawling your site just like Google would and then surfacing all quality problems (which could include content quality, aggressive advertising issues, UX barriers, and technical SEO problems). Leave no stone unturned. I use DeepCrawl, Screaming Frog, and Sitebulb when performing crawls. I’m on the customer advisory board for DeepCrawl, which is outstanding for running enterprise crawls. I typically use Screaming Frog for surgical crawls, although their latest update enables you to crawl many more urls (and faster). And then I use the “young punk” Sitebulb to polish things off. The combination of the three enable me to get a granular view of a site from a quality perspective. Keep creating great things: Continue publishing high quality content (10X). Don’t hold back on doing great things just because you are negatively impacted. Instead, drive forward and let Google know you are producing high-quality content written by experts in your niche, and that users love your site. A byproduct of doing this is that you might gain additional high-quality links. And remember what I said about E-A-T and how Google looks at that? It’s important to do this. Gain objective feedback: Get objective feedback from real people. Don’t ask your spouse to review your site, your kids, or your employees. Have real consumers go through your site and give them tasks to complete. Learn about their experience, if there were any annoying problems, and if they felt that your content met, or exceeded, their expectations. Nuke aggressive, disruptive, or deceptive ads: Surface and handle aggressive and deceptive advertising that’s running on your site. It’s ok to run advertising, but it’s not ok to overwhelm users with disruptive, aggressive, and deceptive ads. Don’t prioritize monetization over your users. There’s a good chance you’ll get burned if you do. Bumps in the road: Understand that you might see bumps in the road as you work towards recovery. Keep driving forward. Keep publishing outstanding content. Keep looking for ways to improve quality. And definitely run all changes through your SEO team, agency, or consultant. Don’t fall back to old ways… Remember, Google only rolls these broad updates focused on quality a few times per year. Don’t miss your opportunity to surge back. Summary – The March 7, 2018 update was huge and the March 14 tremor was even bigger. Now your work begins. This was one of the biggest updates I’ve seen in a while. It seems Google once again improved how it assesses quality, and with Google always looking to surface the highest quality content for users, that’s a really big deal. If your site has been impacted negatively, then follow the bullets I listed above. Work hard to significantly enhance quality over the long-term. Fix all of your quality problems. Don’t cherry pick issues to deal with. Tackle them all. That’s how you win. Good luck.